The Asia Pacific Regional Internet Governance Forum (APrIGF) is underway in Macao, China from July 1-3 2015. The APrIGF is one of the key regional initiatives on Internet governance which provides an open platform for multi-stakeholders to discuss and identify issues and priorities, and ultimately advances the development of Internet governance in the Asia Pacific region as well as bring forward and contribute to the wider global Internet community. There is a wide and comprehensive program. Remote participation is available via ICANN Adobe Connect which includes video, slides and text transcription. Links are available via the agenda. Macao is on CST = UTC+8 thus 12 hours ahead of NYC. The Internet Society is a sponsor of 2014 Asia Pacific Regional Internet Governance Forum (APrIGF) happening August 3 -6 2014 in Delhi, India. The 2014 theme is ‘Internet to Equinet – An Equitable Internet for the Next Billion‘. APrIGF serves as a platform for discussion, exchange and collaboration at a regional level, and also where possible to aggregate national IGF discussions, and to foster multi-lateral, multi-stakeholder discussion about issues pertinent to the Internet in Asia. Video and live transcription of all tracks are provided for remote participants, who can contribute via Adobe Connect. Delhi is on UTC+5.5 thus 9.5 hours ahead of NYC. 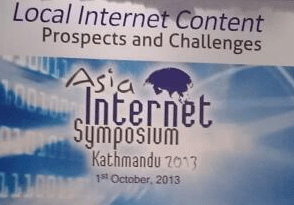 Today, Tuesday October 1 2013 the Asia Internet Symposium (AIS) is being held in Kathmandu, Nepal. This is the 6th AIS in the last year, with previous events having taken place in Manila (twice), Sydney, Gangtok, and Kolkata. The theme of AIS Kathmandu is ‘Local Content : Prospects and Challenges’ and participants will examine how local content in a developing country (Nepal) is created, exchanged and adapted. The event will discuss challenges linked with local content development in a country with 123 languages spoken as mother tongue. Speakers include Internet Society Asia-Pacific Regional Bureau Director Rajnesh Singh. AIS Kathmandu will be webcast via the Internet Society Chapters webcasting channel. Nepal is 9hrs 45mins ahead of NYC. On 7-8 June 2013 in collaboration with the Thailand Internet community, the National Science & Technology Development Agency (NSTDA) and the Ministry of Information & Communication Technology (MICT), the Internet Society is hosting the INET Bangkok, with a conference theme of “Internet: The Power to Create.” The multitrack program will focus attention on how the Internet can become a positive and productive force in society through innovative and new applications. The conference will be preceded by a VIP gala dinner on June 6 at which the .TH group (Thailand ccTLD) will be celebrate their 25th anniversary. The event will be webcast via the Internet Society Channel, with the Internet Society Chapters Channel catching some of the overflow. Bangkok is UTC+7 thus 11 hours ahead of NYC. What: INET Bangkok: Internet: The Power to Create. Many Internet Society members worldwide are following the Internet Society Hong Kong Chapter‘s IPv6World Asia event series via the Internet Society Chapters Webcasting channel. On World IPv6 Day, Jun 8 2011, there was Kickstart IPv6!, and then on Sep 2 2011 After World IPv6 Day, what’s next? We are happy to announce the webcast of a further event “Deployment Experience with IPv6” on Tuesday November 8 2011. Time is 3pm-5pm HKT = 0700-0900 UTC = 0200-0400 EST. Panel Discussion: New Generation of Internet Protocol IPv6 – Are you Ready?